It's time for a little classic fun with the Triumph Sports LUMEN X 20" Table Top Billiards. 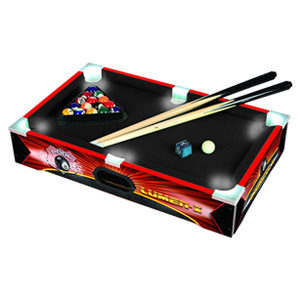 This billiards game is designed to go anywhere and be played anytime. That's because it features a small overall design that easily fits on a table, making it great for a little escape, and features LED light-up game play so you can play anytime you want. The billiards table includes an automatic ball return built-in and comes complete with everything you need for gameplay including balls, cues, and chalk. The board runs on 8 AA batteries (not included).